Many Android users are reporting a glitch with Google's new Google Play store that is causing their paid downloads to "vanish" from their accounts. Previous purchases usually appear in the "Installed / Up To Date" section within Google Play, but for some, they're simply not there. 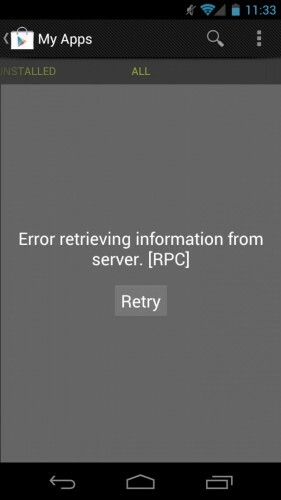 Others cannot reach this section at all, and are greeting by a "Error retrieving information from server [RPC]" message when attempting to access it. According to Pocket Gamer, users have been experiencing the issue for around 72 hours now, but Google is yet to provide a fix or release a statement acknowledging that there's a problem. It's likely that this is simply a server glitch and that your purchases are still safe and sound, but it's still frustrating to Android users who are unable to access them — especially since the issue has been present for so long now. As soon as Google acknowledges the problem or provides a fix, we'll be sure to let you know. Are you experiencing problems when trying to access previous purchases within Google Play?